Women have been involved in the practice of chemistry since the earliest recorded times, such as making beer and preparing medicinal compounds.While wise men all over the world have been studying alchemy for millennia, did you know the first alchemist was actually a woman named Maria Hebraea (also known as Maria the Jewess, Maria Prophetissima, Maria Prophetissa, Mary Prophetissa and/or Miriam the Prophetess)? Maria is believed to have lived in the city of Alexandria in the Nile delta of Egypt somewhere between the first and fourth century AD. 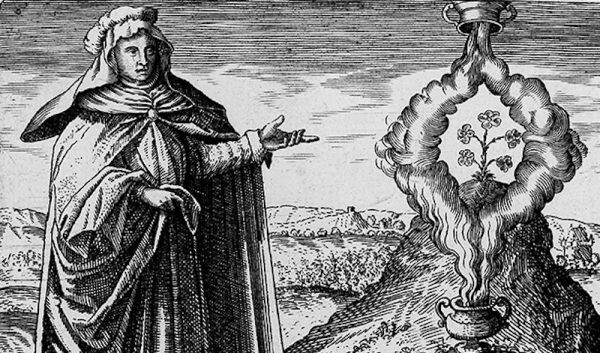 Because none of her original writings survive, we only know about her through the writings of Egyptian alchemist Zosimos of Panopolis (who wrote the oldest alchemist books known in the fourth century). Maria is credited with both inventing and improving several chemical apparatus (particularly with heating and distilling equipment such as stills and relux condensors). She is most famous for inventing a distilling chamber called the tribikos, a sealed vacuum for collecting vapors known as an extractor and her most famous contribution – the kerotakis, which we all used in science class called the bain-marie (which translates to Maria’s bath) and is a double boiler with an upper pan where you can cook food resting above a lower pan of boiling water. The food stays at the same temperature as the steam condensing beneath it. Cheers to you, Maria Hebraea, for all you really were and all that you accomplished!